The Twitterverse quickly clicked on the link to read the BREAKING news. But when they clicked, they found old news. But the Twitterverse thought he was trying to fool them again, so they didn’t click on the link. I’ll stop my version of Aesop’s famous fable there. The moral of the story: We’re facing a growing epidemic on Twitter. The media’s throwing around BREAKING all too often and its overuse is taking away from the intended urgency of the word. Almost everyone on Twitter has a pet peeve. Some get annoyed by those who use more than 140 characters. Others wonder why some never engage. And then there’s the people that tweet way too much (guilty). Now I’m taking up the cause to rid the Twitterverse of my biggest pet peeve — the rampant use of BREAKING. I see it multiple times a day in my Twitter stream and as a rough estimate, I’d guess just 20% of those tweets contain actual BREAKING NEWS. The cable news networks destroyed BREAKING NEWS years ago — that platform’s a lost cause. But maybe we can save Twitter from jumping the BREAKING NEWS shark. But what makes something worthy of BREAKING? There are no official guidelines or rules, so let’s make some. Tweet #1 Well, that’s a standard piece of information released every month and it’s “essentially unchanged.” So I’m going to go with a not BREAKING. It’s tough to call something BREAKING a day after many first found out about it. Some could argue this isn’t even news. If it is, it doesn’t deserve a BREAKING NEWS label. Ah ha! Now that’s some actual BREAKING NEWS. During the past few weeks, the sports world in particular has been loaded with examples of actual BREAKING NEWS. From the Ramos kidnapping, to the alleged details of Sandusky and Fine, to the sudden death of a New Mexico football player, we’ve seen big stories with new details BREAKING seemingly every day. Good for Tiger, bad for the proper use of BREAKING. Darren Rovell, CNBC’s plugged-in and informative sports business reporter, is a serial BREAKING abuser. “This just in” is much more appropriate than BREAKING in this case, don’t you think? Michael Phelps will be part of another ad campaign. Ok…next? Just like Tiger’s deal to endorse drops and gels, it’s more of an announcement than proper news. Thank you @stevewilsonap for keeping our Twitter streams BREAKING clean. As I stand up here on my soapbox railing on and on about a problem, I need to suggest a solution. So here are four suggested guidelines for properly using BREAKING in a tweet. Consider it a mental checklist to complete — before hitting the caps lock button. 1. Is it actually news — something that’s new, unexpected and affects a large number of people in your audience? 2. Is it really BREAKING now? On Twitter, if it’s older than an hour, it’s not BREAKING anymore. 3. After it’s BREAKING, will there be more details to follow? If it’s just a one-and-done piece of news, it’s not BREAKING. It’s just news. 4. Could another term fit better? Could you change it up with a “News” or “Developing” or “Just In”? One of Twitter’s great challenges is posting something that matters, that gets retweeted, that makes others see you as knowledgable and influential. BREAKING has become the low-hanging fruit in a 140-character world. It’s the easy way to catch someone’s eye on an attention-deficit platform like Twitter. Perhaps my campaign to end BREAKING abuse isn’t a big deal. This post probably won’t be up for a Pulitzer or launch me toward the Nobel Peace Prize. But if we keep overusing BREAKING, its meaning will carry as much weight as it does when scrolling beneath Nancy Grace. And that would be a sad modern day fable. Paid Athlete Posts Are Here To Stay, But What Should They Say? In the “Roaring 20s,” it was Babe Ruth hawking everything from tobacco to underwear. 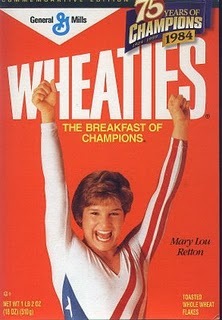 In 1984, Mary Lou Retton made history on the front of a Wheaties box. The relationship between athletes and advertising is nothing new. For decades, sports has mixed with products to produce big money for both sides. Now, as traditional methods in both media and marketing start to erode, the mix of athletes and endorsements enters a whole new era. Last month, CNBC sports business reporter Darren Rovell noticed some curious activity on Michael Vick’s Twitter account. Why was the Philadelphia Eagles quarterback tweeting about McDonald’s and Thanksgiving recipes? The answer was easy, even without Rovell’s subsequent reporting: Vick’s getting paid to send out those tweets. Vick’s not the first athlete making a buck through his social media channels. An ESPN.com story in March detailed how the practice is quickly sweeping through the world of action sports. And how about celebrities? American brain cell killers like Charlie Sheen, Lindsay Lohan and the Kardashians have all brought in significant figures with a simple tweet. Some may think this new form of advertising is cheesy. Fans don’t “like” or follow an athlete to be bombarded with sales pitches. But it can work effectively if done well. The key: Drop in product mentions occasionally and subtly. Many athletes are now looking at contracts containing social media clauses. They’re being asked to make a certain number of posts, at specific times. In many cases, they’re given scripts of what they need to tweet. But fans aren’t dumb. They can see through obvious, forced messages. Take Michael Phelps for example. The 14-time Olympic gold medalist tweeted this pic to his 100,000+ followers. I and more than 32,000 others clicked on it. Why? Perhaps because the actual text in the tweet didn’t sound scripted. I didn’t bite and I doubt many did. That’s an ad in its most generic sense and it’s not going to generate clicks. Comprising posts that make a fan click is an emerging art form advertisers and athletes have to master. There’s big money to be made by companies and athletes that can team together to make their messages sound organic. Amy Martin, who helped turn Shaquille O’Neal and a handful of other athletes into social media stars, points out there’s a science to this new form of marketing. The concept is obvious: Use athletes to push messages to their thousands, and even millions, of followers. But the implementation isn’t that simple. Most athletes have one source of income — a contract with their team. Social media’s created an opportunity for many to add another revenue stream. The great thing is, they don’t have to “Be Like Mike” to cash in. First and foremost, they need to sound human.